Mehereta Baruch - Is Zionism Racism??? Mehereta Baruch is a Zionist and a Jew. Meherata came to Israel with her family from Ethiopia, traveling on foot to Sudan to get to Israel and suffering many hardships on the way. She says, "Israel was always the place of our dreams. When we finally arrived it really felt like the paradise I was promised." Think about it - Is Zionism racism? Do you think Meherata is a racist? She arrived in Israel aged 10 without her parents, who followed years later. She went from a boarding school for immigrants to pursue a masters degree before joining theater groups. 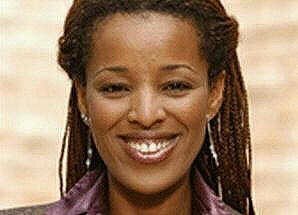 Baruch said she had gone on the television program to further her own career rather than represent Ethiopian immigrants but was happy to be a role model for any who might be watching. "The youth now need to see success stories. They see that I am accepted and that maybe they can achieve that, too," she said. "It makes them feel that anything is possible." "Israel was always the place of our dreams. When we finally arrived it really felt like the paradise I was promised." I had so many new things to learn when I first arrived in Israel – running water and electricity were a complete novelty to me. I was nine when my family decided to leave our village in northern Ethiopia out of a desire to be in our homeland. After leaving my mother behind to care for my grandparents, we began our long walk through the Sudan. We didn’t know how tough the journey would be to get there. As a child I remember being told by my grandmother that Jerusalem was like Gan Eden (the Garden of Eden) . Israel was always the place of our dreams. When we finally arrived it really felt like the paradise I was promised. But I missed my mother and prayed every day to be with her. It took six years before we were reunited and I was able to get on with my life. I tried the ‘melting-pot’ approach to absorption but it didn’t feel right for me. My own culture and heritage became more important to me and I started to believe in my own identity. I wanted a university education but I didn’t have the right qualifications because my parents didn’t think studying was necessary. I found a pre-university course designed to get young Ethiopians into university and through this was accepted for a psychology degree. Of course a Bachelor's degree isn’t enough to get anywhere in Israel so now I’m studying for a Masters in sociology. I want to use my skills to help people. Many of the agencies that deal with the Ethiopian community do not have the understanding required to help us. I’d like to be involved in bridging that gap. I perform with an Ethiopian theatre group and we would like to use this medium to communicate with young Ethiopians. Theatre is new to our culture, so we are teaching them how to use it. We also want to express our concerns to Israelis – they can learn a lot from us too.